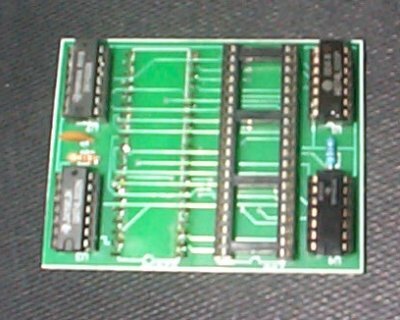 This is a PCB based on an article in one of the Fluke magazines that explained how to make adapters to allow testing of boards based on processors for which Fluke pods were not available. The article takes a pod that has similar characteristics to the CPU required, and explains about converting the signals, and conveniently (for me), it ended with the full wiring for an S2650 adapter. This shows the top of the board. 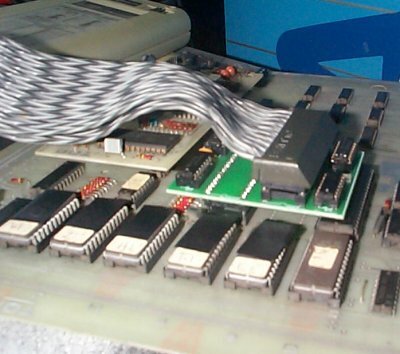 visible are the logic chips used to do the necessary combination and other changes to control lines, and the socket where the Z80 fluke plugs in. To make it more rubust for continued use, I will probably fit a 40 pin ZIF socket into this socket at some point. Also, just visible in the picture are the smoothing caps fitted underneath each TTL used, not sure if these are strictly necessary, but I had some handy so I put them on. Here is the article that the PCB is based upon in DJVU format.